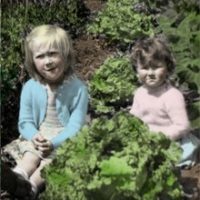 When asked what fruit I grow (in a garden questionnaire the other day), I was about to write, “sadly, none.” Then Sarah reminded me about my serviceberry, Amelanchier. This is one of the best native trees, a hard worker in the garden in almost every season. Lovely grey bark in winter; white spring flowers; late-summer blueberry-like fruit which the birds love; red or orange fall foliage. 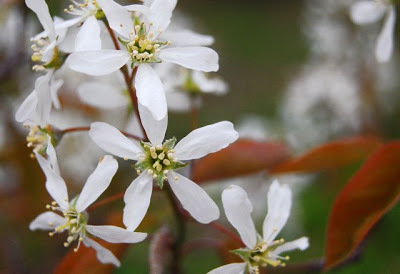 The serviceberry comes with a variety of names (including Juneberry and shadbush) and a variety of sizes. Generally, though, it’s a small, multi-stemmed tree or shrub that adapts well to urban gardens. It’s one of the choices available through Toronto’s Street Tree Program – free trees for your front yard. Our neighbour G. chose a serviceberry when her Norway maple had to b removed due to carpenter ant infestation (the ants didn’t kill the tree, but they did severely weaken it by tunneling through the dead wood). The one thing a small tree can’t provide, though, is shade. At least, not the kind of heavy canopied shade supplied by the (mostly) Norway maples on Toronto’s streets. We’ll have to deal with that in years to come. 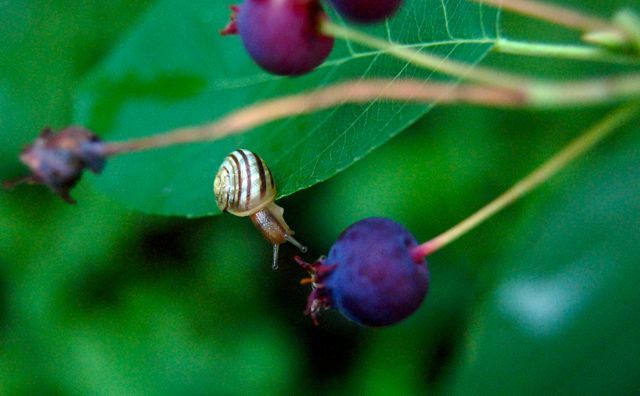 In the meantime, I’ll enjoy my serviceberries – when the birds (or snails) don’t get them first.